Hier die allerersten Fotos von uns vom neuen MAN Lion's City. Und ja: Dieser Bus wird begeistern! Neues Design, neuer D15 Motor (9 Liter), neues Innenraumlayout (Bus wirkt unglaublich groß innen) und ein komplett neues Cockpit. Haben wir so, in dieser Art noch nie gesehen. Lenkrad lässt sich zusammen mit einem mutig designten Instrumententräger verstellen, es gibt nur noch dieses eine Cockpit. Einzelradaufhängung vorn und neue Aussenspiegel (rechts endlich höher aufgehängt). Morgen gibt's mehr Infos, bessere Fotos und ein erster Film wird folgen. The all-electric Mercedes-Benz Citaro runs locally emission-free and almost silently, taking electric mobility using city buses to a new level. The 12-metre variant will celebrate its world premiere in September at the IAA Commercial Vehicles show, with the start of series production also taking place this year. 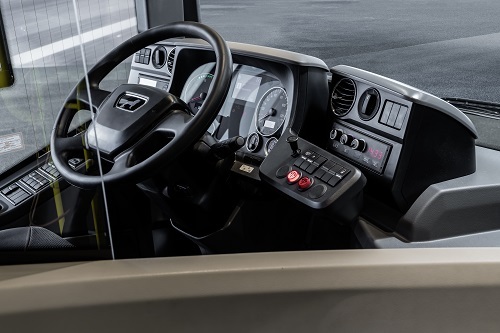 The new Citaro offers an impressive and hitherto unknown standard of energy efficiency. The intelligent modular concept for its battery and charging technology is similarly compelling. When it comes to giving figures for the vehicle's range, Mercedes-Benz prefers to consider a "worst-case scenario", taking its direction from the challenging 'Standardised On-Road Test cycle', SORT2. According to this, the Citaro with a full complement of batteries can achieve an operating range of around 150 kilometres in the summer. In other words, it is already possible to serve some sub-networks within the daily coverage of a city bus without opportunity charging. Laatst gewijzigd door zone2000 op Ma 17 Sep 2018, 14:21, 2 keer totaal gewijzigd. Zijn er al ergens foto's van het interieur van beide bussen? For city busses, the trend is clearly to alternative drive systems. Along with the new MAN Lion’s City G and the MAN Lion’s City with MAN EfficientHybrid, the fully electric MAN Lion’s City E will make its first public appearance at IAA 2018. The next step will be to test it in everyday conditions in various European cities before series production begins in 2020.